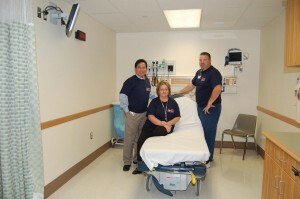 Oswego Hospital recently opened four new patient treatment rooms in its emergency room. Showing off one of the rooms from the left are Cupid Gascon, MD, Medical Director of Emergency Services at Oswego Hospital; Debbie Herrington, senior registered nurse in the department, and David Ramsey, RN, clinical nurse manager of the Emergency Room. Oswego Hospitalâ€™s renovation of its emergency room, the regionâ€™s gateway for the treatment of serious illness and injuries, is one more step closer to completion as four new patient treatment rooms have opened. 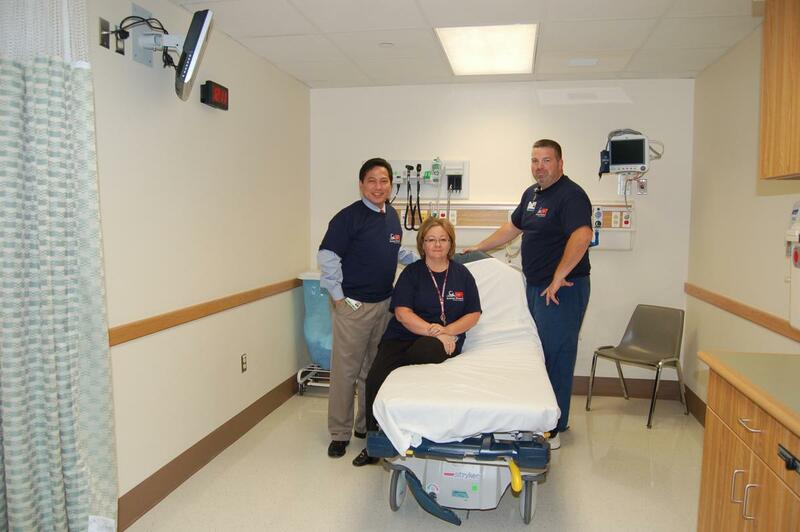 Oswego Hospital offers the only emergency room in Oswego County. Once completed at the end of the year, the new ER will feature 17 private patient rooms, all with the latest in technology, including a state-of-the-art cardiac monitoring system. The department will also house a sub acute area, where those with minor illnesses and injuries will be treated. The New ER is just a portion of the $18 million hospital project. Just as the ER work is under way, the adjacent medical imaging department is undergoing its own transformation. When finished, this department will offer some of the areaâ€™s most advanced medical imaging equipment. Portions of the hospital project were finished earlier this year. A new laboratory and intermediate care unit were opened in March. The expanded lab features new instrumentation and automation to improve the departmentâ€™s efficiencies and testing turn-around time. One piece of new automated equipment moves specimens along a track, stopping them at stations where specific tests on that sample are performed. Just down the hall from the lab is the intermediate care unit (IMCU), which is a new clinical service provided at Oswego Hospital. In the IMCU, specially-trained nurses deliver care to patients that need continuous monitoring, but not the critical services provided in the intensive care unit.